Overview: Offers both linux and windows and unlimited features depending on which package is chosen. PHP, CGI, Perl, Python, SSI, SSL, RoR, ImageMagick, Curl, etc. Bottom Line: Arvixe is good for start-ups on a small budget and for learning purposes. Specifically for personal sites, small business sites and adult web sites just starting out. 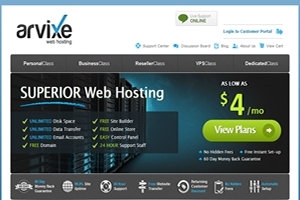 Click here to visit Arvixe Web Hosting now!